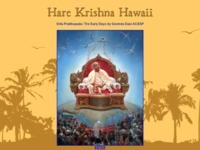 A website by Govinda Dasi, Srila Prabhupada’s disciple where memoirs about our beloved Srila Prabhupada and the early days in Hawaii, Her involvement in the Hare Krishna Movement starting in 1967, etc. will be posted. Category Matajis, Srila Prabhupada June 7, 2012 by ISKCON Desire Tree.